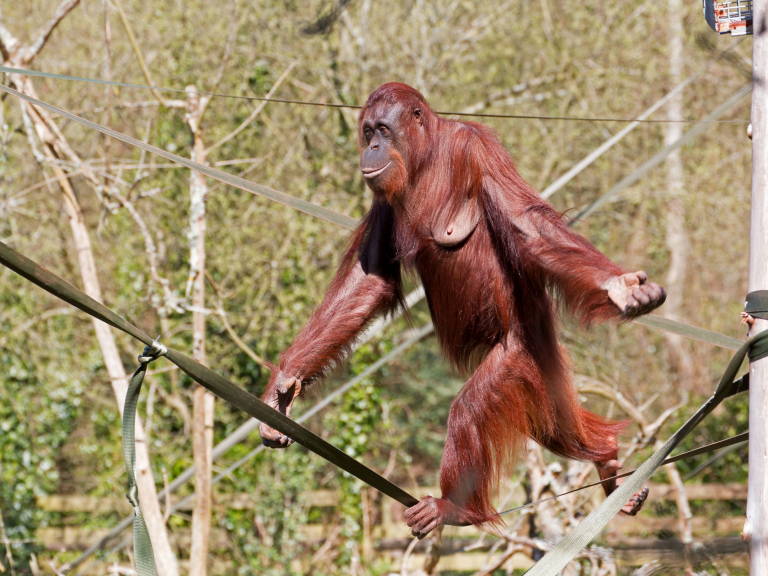 Mali, who lives at Paignton Zoo Environmental Park in Devon, balanced effortlessly like a tightrope walker on the line, which is about 20 feet off the ground. Zoo spokesperson Phil Knowling said: “She seemed to balance quite effortlessly, using her long arms like an acrobat uses a pole. It was a quite amazing bit of skill. You can’t imagine many humans doing that! In addition to Mali and Tatau, Paignton Zoo’s group of Bornean orang-utans includes females Gambira, Chinta and her baby Natalia. Paignton Zoo Environmental Park is a registered charity. For more information go to www.paigntonzoo.org.uk or ring 0844 474 2222.